Ubabub offers some of the most stylish and versatile child beds you have seen including the fabulous Pod Cot, which grows with your child. The Pod Cot is a cozy cocoon-like bed with with modern, smooth, rounded edges and transparent sides that give parents the perfect view of baby at all times. Plus, see-through sides allow Baby to see the world “bar-free.” This innovative crib is simple to assemble and easy to clean, and it seamlessly converts into a junior-sized bed when your baby grows into a toddler. Ubabub’s Pod Cot meets the highest global safety standards. The bar-free pod’s sides are laser cut with star shapes, which allow for additional airflow, and there is no need to worry about baby getting “stuck” between the slats. A low height, makes it easier to lift baby in and out and the mattress can be positioned in either an upper or lower position, adjusting to your growing baby’s needs. When Baby is ready, the Pod Cot easily converts into a toddler bed that is low to the ground and stylish at the same time, making the transition a snap. The Pod Cot’s timber plywood components have been sourced from renewable plantations and all of the finishes are non-toxic. All other materials used in the construction of the crib are recyclable and the mattress is hypoallergenic. 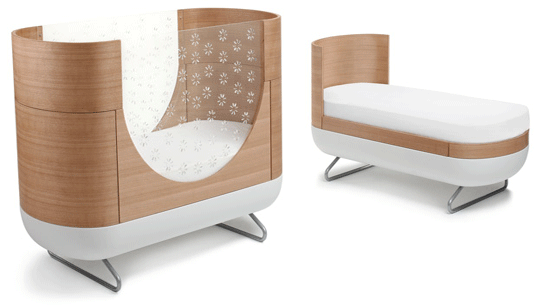 This Ubabub Pod Cot is nice! But, why is the cost out of range? I would most certainly buy for my green-conscious) orphanage, if the price was not so overrated. Ubabub offers some of the most stylish and versatile child beds you have seen including the fabulous Pod Cot, which grows with your child. The Pod Cot is a cozy cocoon-like bed with with modern, smooth, rounded edges and transparent sides that give parents the perfect view of baby at all times. Plus, see-through sides allow Baby to see the world "bar-free." This innovative crib is simple to assemble and easy to clean, and it seamlessly converts into a junior-sized bed when your baby grows into a toddler.